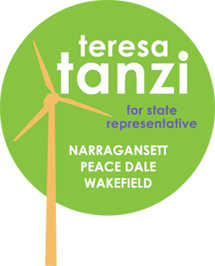 Representative Teresa Tanzi has been a leading advocate in the General Assembly on behalf of the fishing industry, which is so critical in South County. 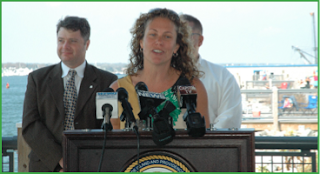 She acted quickly in the 2012 session to make sure the House passed her bill calling for a one-year ban on pair trawling in Rhode Island waters to protect the jobs for fishermen in Point Judith. The practice of pair trawling involves two fishing vessels dragging a single enormous net between them has been attracting out-of-state vessels that use up the region’s herring quota. This one-year ban was intended to allow DEM adequate time to create new regulations to simultaneously prevent the raiding of the resource by out of state boats while not cutting off future opportunities for the Rhode Island fleet. Tanzi has taken numerous actions to assist the fishing industry. In one of her first weeks as a Representative, she met with the new DEM director, Janet Coit, to ask for online permitting for out-of-state fishermen vessels to offload their catch in Rhode Island’s processing plants. The Port of Galilee was essentially hanging a “Closed for Business” sign up on our processing plants because out-of-state boat captains had to find a way to get to Providence during business hours to apply for the necessary permits. She also Chairs the Port of Galilee Task Force and participated in a recent meeting with the newly appointed top regional official from the National Marine Fisheries Service about the challenges facing the industry.